South Africa has signed an economic cooperation deal Saturday that will see Africa’s biggest economy investing in the tourism, energy and infrastructure of the central African nation of Burundi. 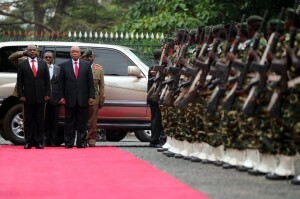 The deal was signed during a visit to land-locked Burundi by South African President Jacob Zuma. President Zuma said that South African businesses were keen to invest in Burundi’s financial services, transport and agriculture. The agreement aims to increase the volume of trade between the two countries following the development of program of action that will outline how the countries will work together. The deal will be a significant boost for Burundi after two decades of insurgency claimed the lives of 300,000, and which ended in 2009. President Zuma was the chief mediator in the talks that finally led to peace in the small, coffee-producing nation.